rec. 2016, Kaustinen Church, West Finland. Vivaldi’s Four Seasons has become so ubiquitous that new recordings tend to seek ever further for a USP that will make them stand out from that vast crowd. Andrew Laurence-King’s booklet notes point towards the detailed visual imagery associated with this music, both in the sonnets connected to each concerto, and also the cross-references in the score that indicate where and how the expression can make these images clear to an audience. This approach is not new, but these are aspects of the work that have been explored here to the full. 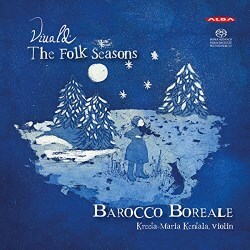 Bird-whistles are brought out for Spring as was done with Kati Debretzeni and the Orchestra of the Age of Enlightenment on the Signum label (review), but Barocco Boreale goes further as the concertos unfold, with a healthy battery of extra plucked strings in the form of a harpsichord, harp, theorbo, baroque guitar, kantele and psaltery. Another major colour change in this recording comes through the addition of a regal, a pungently nasal reed organ that adds dramatic growl for the emphasis of particular highlights. These elements add a great deal of interest in a performance that also reaches deep into string technique to bring out the maximum variety when it comes to winter chill and summer mosquitoes, but rest assured that this is not a “folk-influenced crossover.” Aside from a few slightly extended intros to some movements Vivaldi’s Four Seasons is kept intact in all its glory, but we get for instance a very wittily drunken violinist in the first movement of Autumn, the central movement of which is beautifully slow and atmospheric. The teeth really chatter in Winter, and the “War of the Winds” is underpinned for one last time by that snarling regal. Soloist Kreeta-Maria Kentala’s involvement in a wide variety of period and folk performing makes her performance a joy from beginning to end, and if you’re not fearful of having a bit of fun and exploring the ‘literal’ heart of this masterpiece then this is very much a Four Seasons that can enhance even a collection which already has a number of versions. The fillers are very well performed, the Concerto in C major, RV 114 made a bit special with a harp solo Adagio from Andrew Lawrence King, and the Concerto in D major RV 511 taken by the two soloists “as inspired by an imagined vision of gypsy violinists coming to town.” The familiar Concerto in A minor RV 522 is packed with magic, showing what the imaginative addition of extra instrumental colour, energy and spellbinding sparkle can do to revive an alert interest in an old favourite.